Welcome to my first tutorial! 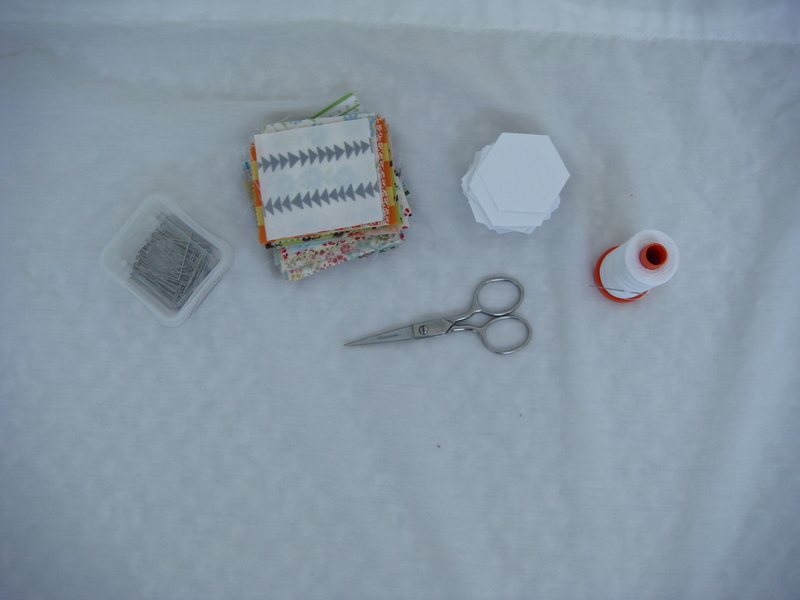 I’m really glad you’re here because english paper piecing (EPP) is something I am passionate about and I think my method simplifies what is admittedly a time-consuming (but lovely!) process. Let’s make some pretty hexies together! 1. Introduction. If you aren’t familiar with EPP here’s how it works. 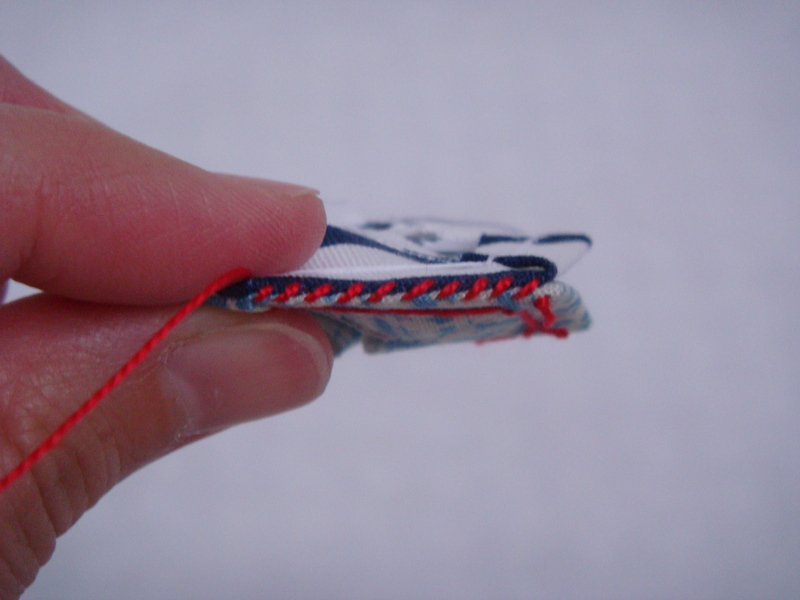 EPP is a very old-fashioned method of hand sewing small pieces of fabric around a piece of paper and then sewing the shapes together before removing the papers and finishing the project. You can read my post on EPP to hear more about what makes EPP so awesome and different from other sewing. 3. Cutting. Oh, the freedom of casual EPP cutting! One of the fun things about EPP is that you can put away your rotary cutter because your cutting does not have to be accurate. 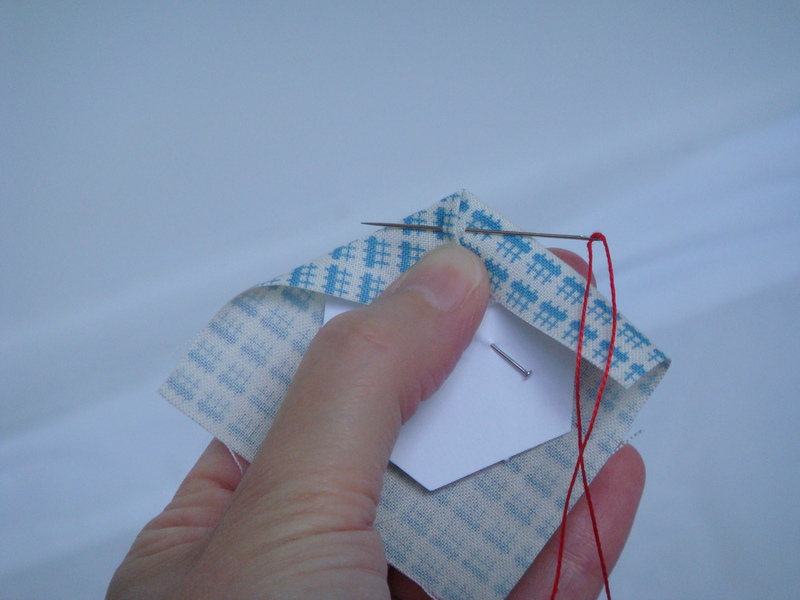 You can simply chop at some fabric with scissors and the paper ensures the accuracy. 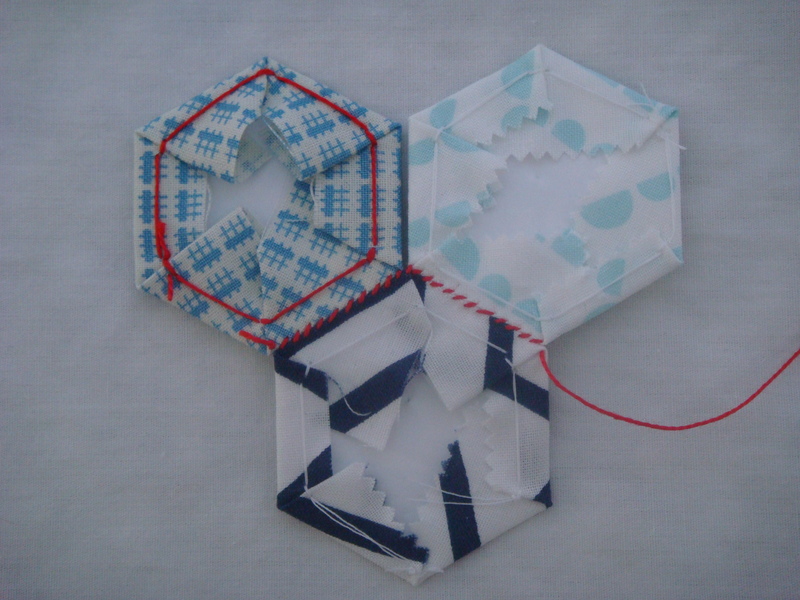 In fact, I use square pieces of fabric for my hexagons and it works just fine. 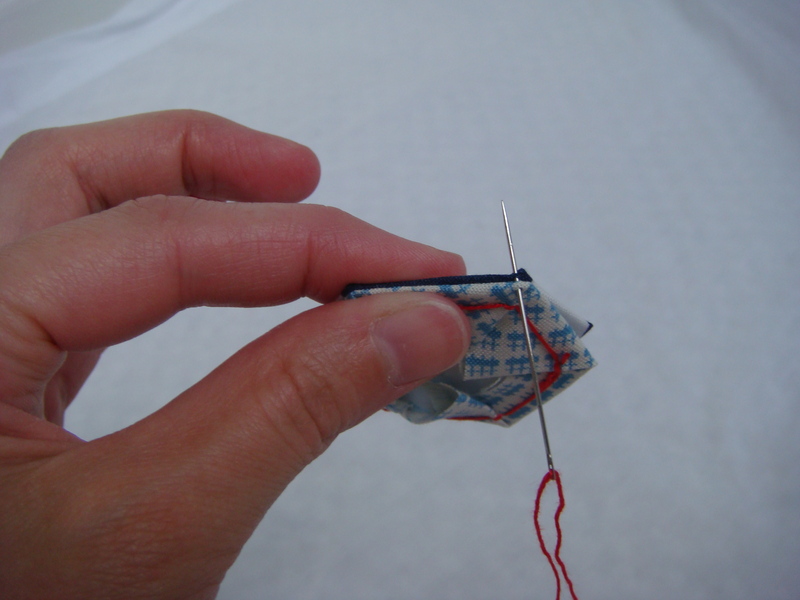 Your fabric needs to be about 3/8 to a 1/2 inch bigger on all sides than your shape. A little less is okay but don’t make yourself crazy by limiting it to a 1/4 inch. A little wiggle room will make your life a lot easier and keep the process relaxing. 4. Pinning. Ok, once you have your supplies and fabric ready to go the next step is pinning. I simply put one pin through the middle of the paper and fabric to hold them together during basting. This prevents the paper from sliding out of place once you get going. This is particularly important with my method since you won’t be sewing through the papers at all. 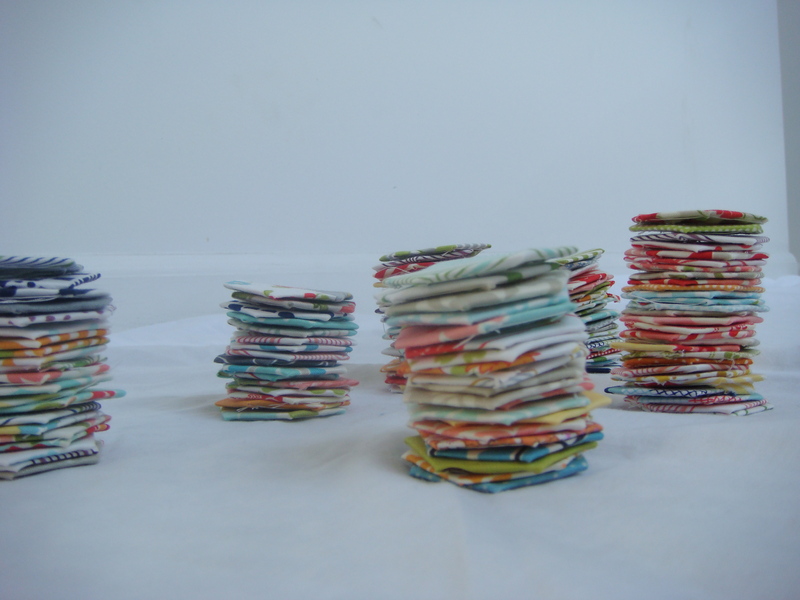 I like to pin a pretty little stack and then proceed in an assembly-line fashion. 6. Ironing. Press your shapes while being sure not to misshape them. I use the tip of my iron and iron toward the shape. 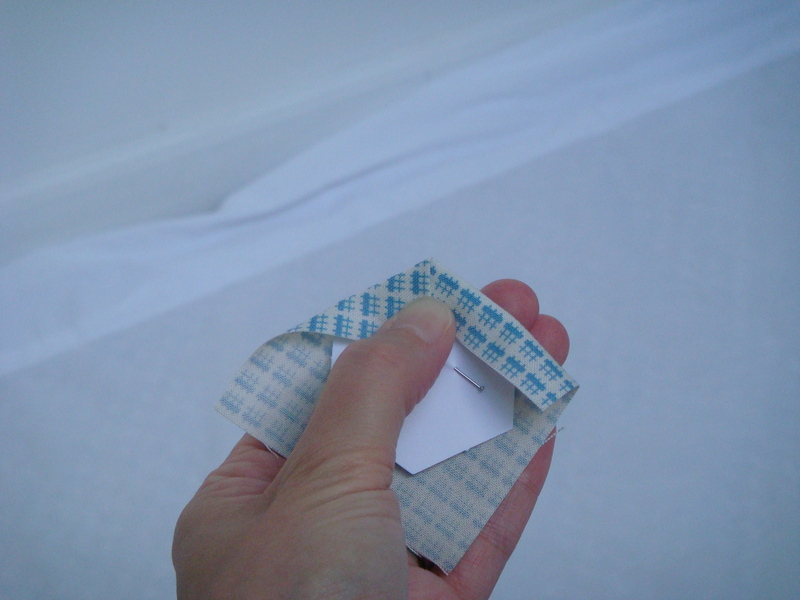 Then when I’m sure the fabric is flush with the paper on all sides I press down to flatten the seam allowances. 7. Whipstitching. 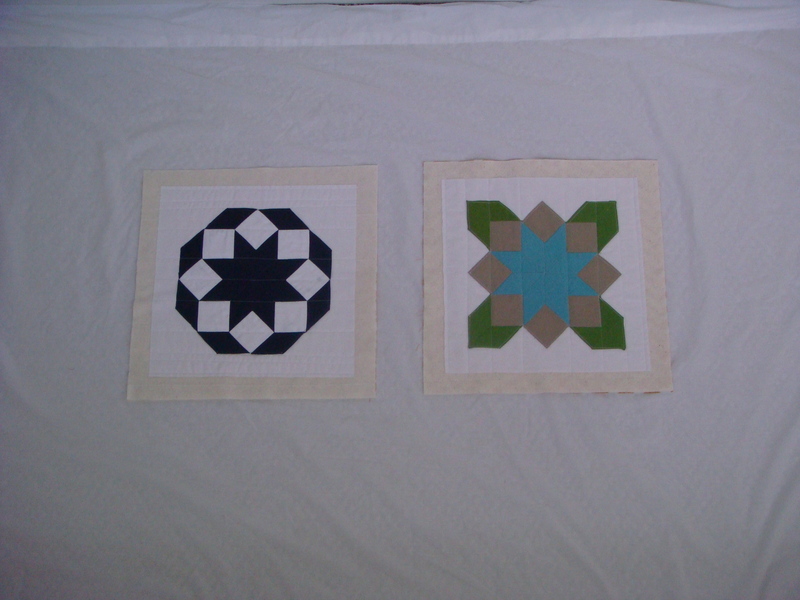 After you’ve basted some cute little piles of EPP shapes, they can be pieced together by whipstitching. At this point it’s not a bad idea to consider your thread color. I’ve never had a problem with hexies but when I did diamonds I regretted using white thread with my dark fabric. 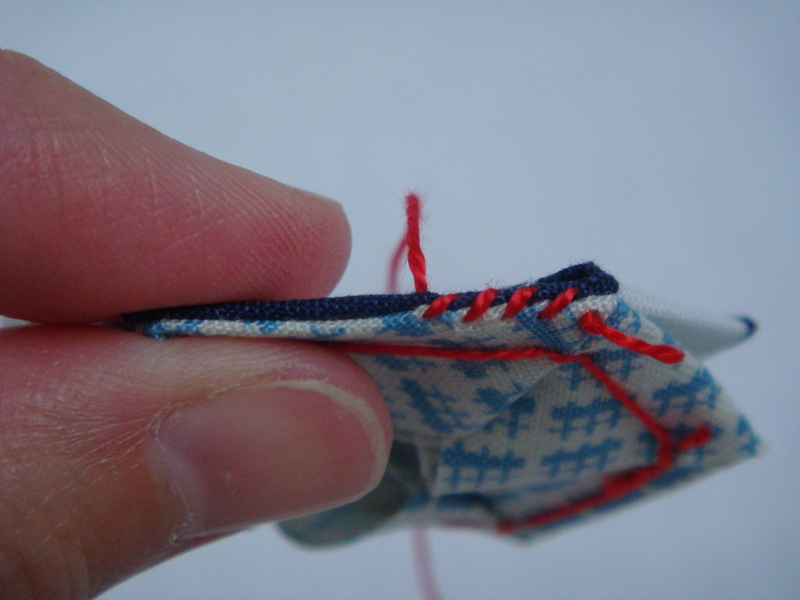 You hold the pieces right sides together and take small even stitches across the length of the shapes. 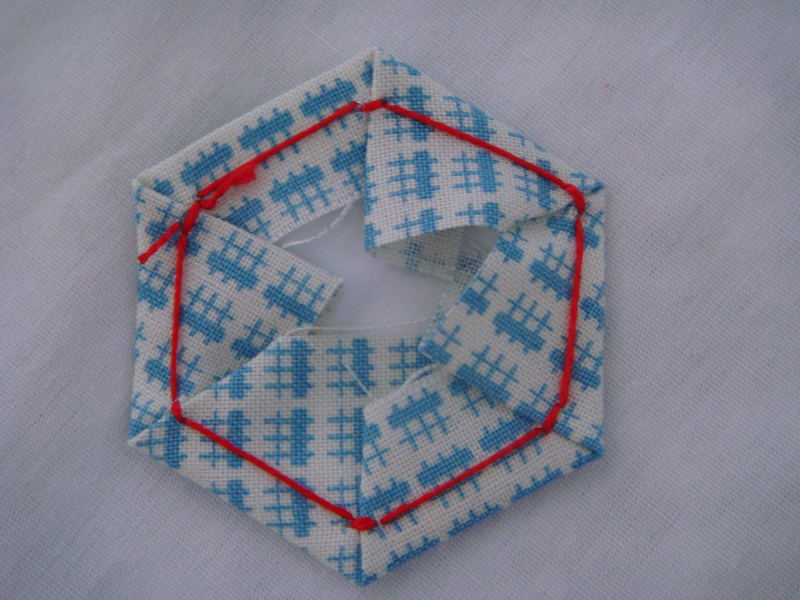 You want to get just a few threads from each hexagon fabric and not eat too far into the middle of the shape or your stitches will be visible and misshape your pieces. Use the paper as your guide. 8. Joining rows. You can piece several together into a row and then join the rows. 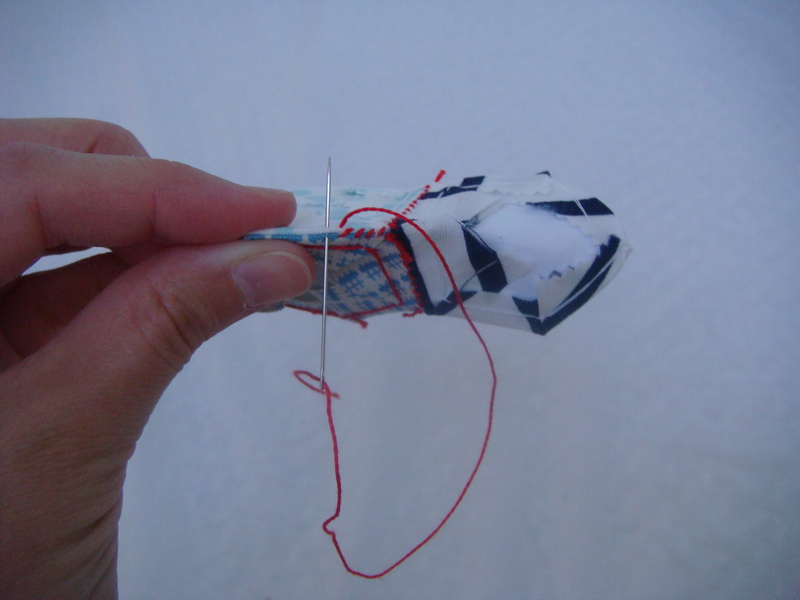 Unlike sewing machine sewing, there is a lot of flexibility regarding what order you do this. You really can’t screw it up because at any point you can always go back and fill in more hand stitches.When you start joining hexies together you’ll realize that it’s sometimes necessary to fold an adjoining hexi in order to get them to lay right sides together for whipstitching. You do not remove the papers until the individual hexagon you are removing the paper from no longer needs to be joined to any other hexagon. 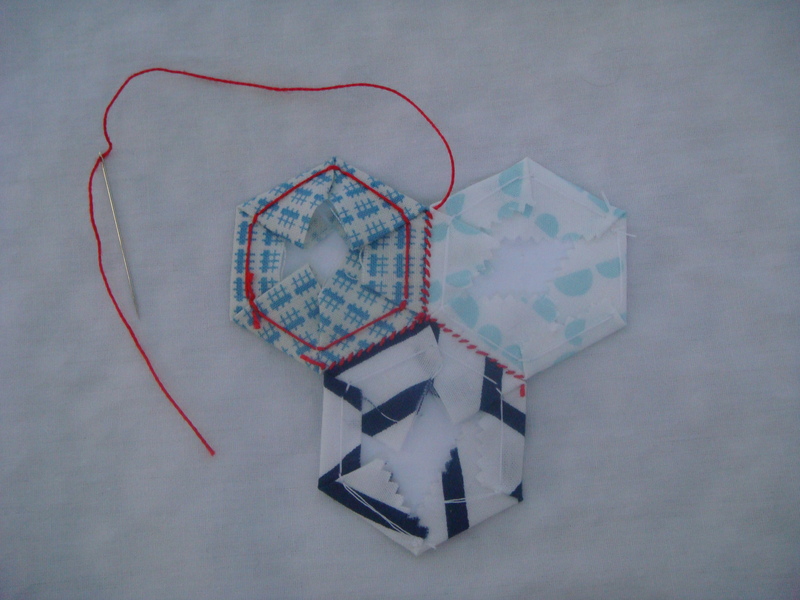 Since the paper is your guide, you want to keep the paper in as long as there is still sewing to do for that hexagon. 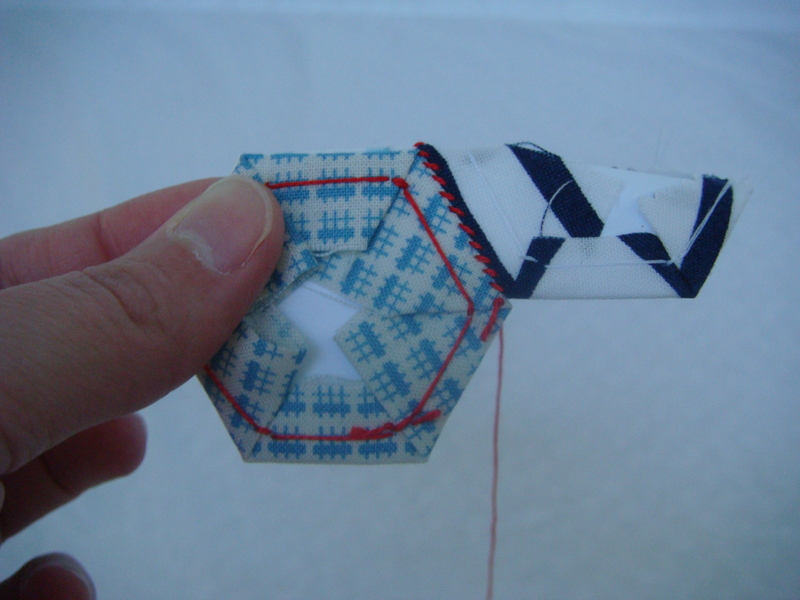 Once the hexagon is sewed into the quilt, the paper has served its purpose and can be removed. There really are endless design possibilities once you get the hang of EPP. Here are a couple of experiments I did with diamonds, squares and triangles. You can even completely design and cut out your own shapes. I’ve used this method to create little ties and bowties to decorate the onesies in this post. All I did was draw the ties on a piece of card stock and cut them into workable shapes. This was a bit easier than some other methods of this project because the EPP created finished edges. Click here for a fun chart that helps with hexagon math from paperpieces.com. It gives you various measurements for different sizes of hexagons and some tips for cutting your fabric. All right, please feel free to ask questions and I will update the tutorial from time to time as questions recur. I’ve also added a “Tutorials” tab to my home page so you’ll be able to easily access this and other future tutorials. This entry was posted in Tutorials and tagged EPP, Tutorials. Bookmark the permalink. 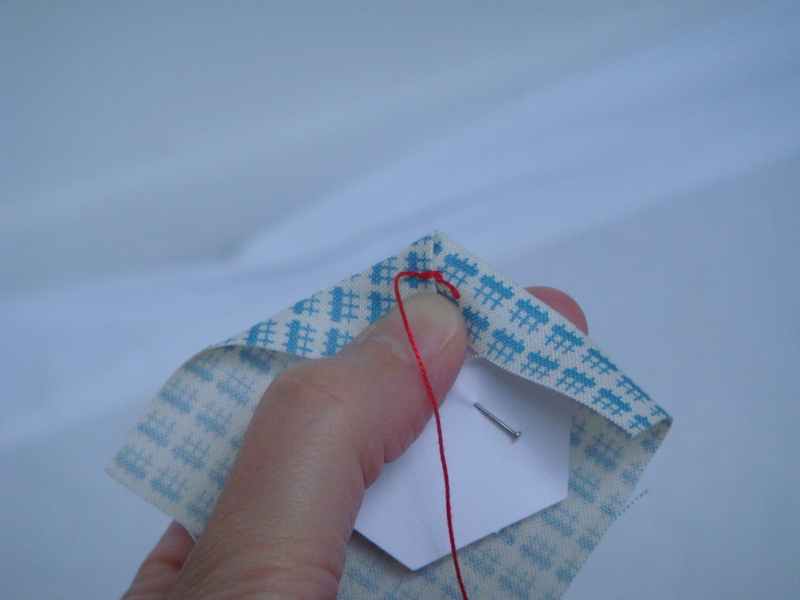 GREAT tutorial, I love the use of the red thread to really show what you are doing! This is the first time I have understood what exactly is going on when someone EPPs. It has seemed so mystical and not understandable to me before. Maybe you’ll convince me to try it! Pinned! Nice tutorial. It’s good to see how far apart you make the stitches. Yes, but keep in mind that my thread was huge! You’ll be able to tell when you’re doing it whether there are enough stitches to hold together nicely. And the first time you decide to get out your seam ripper because you changed your mind about something you’ll realize that hand stitching is very secure! Great tutorial! Very clear. I’m awaiting supplies for my first EPP project and pinned this to refer back to. I’ve hand pieced before, but have never EPPed. I’m wondering if I’m going to love it or hate it. Thanks for sharing your insight. Thanks so much for sharing, Sarah! It’s a great tutorial and has been featured over at And Sew We Craft today! I love EPP. It’s so relaxing to do. Your tutorial is very clear. Using the contrasting thread was a great idea. Keep up the good work. Thank you! Thank You. I never understood this until this tutorial. 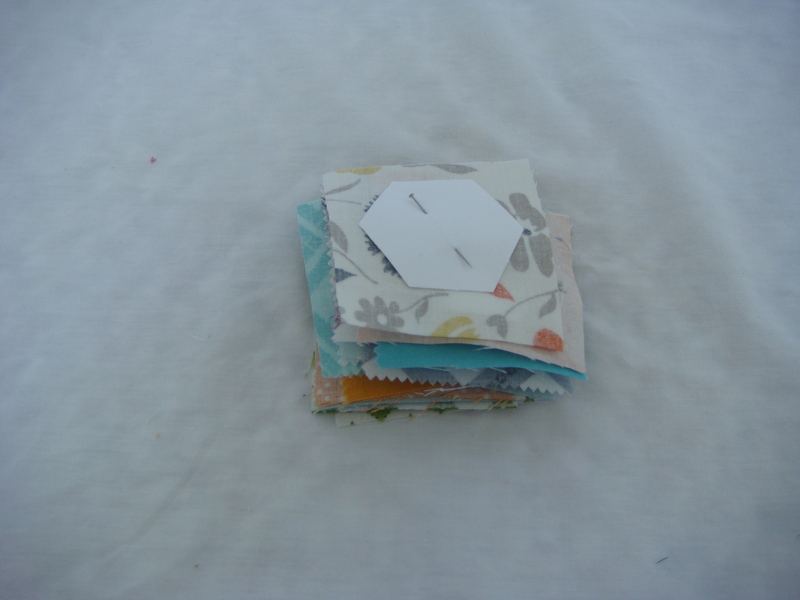 I have lots of scrap that I am now going to make into a Hexagon quilt! 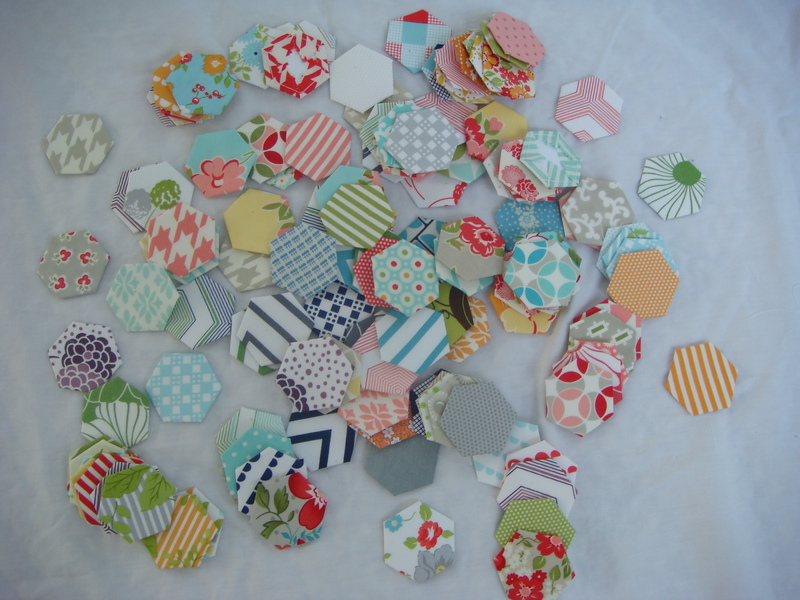 Love the fabrics in these hexies! I recognize some, but they all look so nice together. Congrats on your first tut. Great Job. I’ve been wondering about EPP and your tutorial really answered the question and even made me want to attempt it! REally nice tutorial! Thanks so much!